Customisable chocolates that allow you to create your own chocolate design, shapes and packaging ideal for business promotions and hospitality. Play Willy Wonka and create your very own chocolate bar to your personal recipe. Select your chocolate style, add a flavour if desired, then add fillings and other options to create your very own chocolate bar. 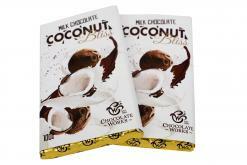 Wrapped in your choice of foil colour with our special "build your own bar" printed wrapper. 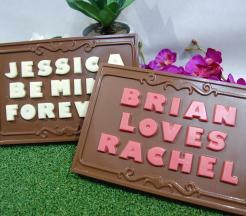 Let your loved one know she is really is your Valentine this year with a personalised block of delicious chocolate. Features a block of 400 grams of creamy milk chocolate embossed with your message in contrasting chocolate colour, foiled in your choice of foil colours and packed in a glossy white box and lid.